Interview with Betsy Bird for the School Library Journal’s Fuse #8 blog. We discuss Zork, my life in the convent, and why The Jeffersons is superior to Catcher in the Rye. Many in the comments section deem this the “Best. Interview. Ever.” Dare you disagree? Interview with the lovely Senfaye on A Maze Of Books. Read it if you’re curious as to why I chose to end the interview by saying “I hate you”—and why when Senfaye asked “What’s your favorite food?” I replied “Your skull.” It’s scandalous! Interview with Amy Alessio for the Young Adult Library Services Association (YALSA). I talk about my experiences as a junior high school science teacher—in particular, of how the entire faculty was mysteriously menaced by a obscene note-writing student known only as “The Foggy Wiener.” I also talk about my participation in Japan’s violent “Naked Man” Festival, and how I discovered the President of the ALA is a whimsical hobo. Interview with someone who hated Odd-Fish. I am pressed to defend my artistic decisions by a high school girl who disliked the book. Probably the most fun yet substantial interview. I talk about the mythological roots of the All-Devouring Mother, the relationship between religion and fantasy, the difference between “shaggy” and “lean” stories, and more. Interview with Adam Callaway of The Weirdside. Includes my ideas about comedy, what makes for a good title, on accessing originality through being deliberately “wrong,” and more. Order of Odd-Fish Week on Paul Michael Murphy’s Murphblog! Part One, about my writing process and the rocky, crazy road to Odd-Fish’s publication; Part Two, in which we talk about handling Odd-Fish’s large cast and wild plot, David Lynch’s “Eye of the Duck” theory, and why there wasn’t an acknowledgments page — as well as videos of both me and Paul reading from Odd-Fish; Part Three, in which I reveal the thing I will always find funny; Part Four, in which I answer the “lightning-round” questions and we see Paul and his two-year-old daughter read from Odd-Fish; and Part Five, the Order of Odd-Fish contest, in which contestants create their own Odd-Fish specialties. (All entries are in the comments section. They’re hilarious!) And here I render my judgment and announce the winner of the contest. Interview with Dina Strasser of The Line blog. We talk about the relationship between religion and fantasy/sci-fi, surprising reader reactions to Odd-Fish, motivating young reluctant writers, and more. 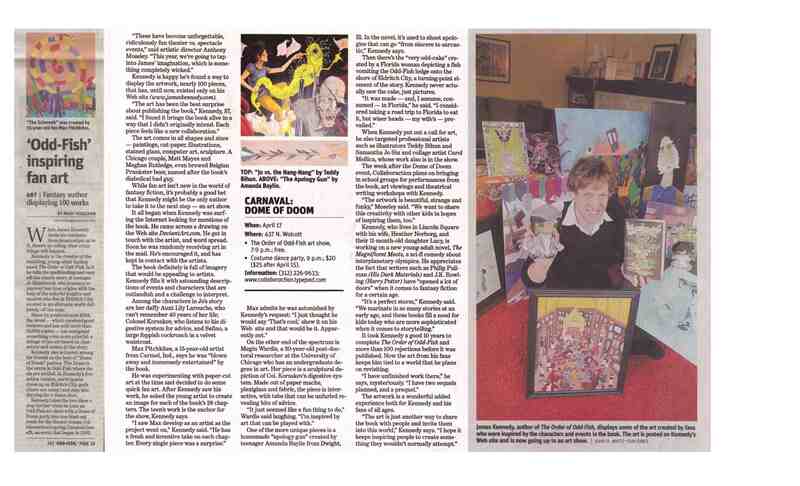 Mary Houlihan of the Chicago Sun-Times writes about the Order of Odd-Fish art show. Learn about the art and the artists who contributed to the Odd-Fish gallery show on April 17, 2010. Radio interview with Alison Cuddy of NPR’s “Eight Forty-Eight” in Chicago.. This interview is about the Odd-Fish fan art gallery show and the book in general. Interview with Eve’s Fan Garden. I discuss my discovery that adults are often illiterate compared to young adults, I lay out my dream cast for an Odd-Fish movie, and I showcase my favorite books that you might not have heard of. Interview with the Carly Reads blog. In this interview in advance of my appearance at the Greater Rochester Teen Book Festival (May 2010), I reveal why Printz-winning YA novelist Terry Trueman still owes me $134.43, and what he did to poor Jon Scieszka’s shoes. Interview with Melissa at the Book Nut blog. I talk about the difficulties of getting The Order of Odd-Fish published, my high school friend who was the inspiration for Jo, the idea of an “urban Narnia,” and the origin of the All-Devouring Mother character. Interview with Librarian Beat, a flirty librarian-by-way-of-Sassy-magazine blog.. “Would you be willing to read me a bedtime story?” “Sure. I’ll even throw in another story the next morning.” Rowr! Profile by the Notre Dame Observer. It’s the student newspaper of my alma mater. Error in the first line, though: I’m from the class of 1995, not 2000! A long, in-depth interview with Marcus Gilmer of Chicagoist. I reveal the origin of the Belgian Prankster, I get snotty about the literary conventions of realism, and I ramble on about G. K. Chesterton and my theories about the Comedian from Watchmen. We were drinking Japanese beers at a sushi restaurant during this interview, and I got a bit garrulous. Veronica Bond interviews me for the Gapers Block Book Club. We talk about other authors I admire, how I came to write Odd-Fish, and how one must write up to children, never down to them. The Order of Odd-Fish mixtape on Largehearted Boy. The music blog Largehearted Boy has a series called “Book Notes” in which authors create and discuss a music playlist that is in some way relevant to their recently published books. Click here to listen to the soundtrack I chose for The Order of Odd-Fish and read my commentary for the songs I picked. Collaborations and Spectacles: How I Promoted The Order of Odd-Fish, Even When All Hope Was Lost. An article I wrote for the Prairie Wind, an online for the Illinois chapter of the Society of Children’s Books Writers and Illustrators (SCBWI). “Buy My Book, Please” by Sean Callahan in Notre Dame Magazine. I am profiled by Notre Dame magazine, along with some other authors. “The Most Dangerous Beard In Town.” The Chicago Reader published this short story of mine in their 2008 fiction issue. A video interview with some members of the Teen Advisory Board of the Evanston Public Library. “A Wrinkle in Her Story.” I review Listening For Madeleine: A Portrait of Madeleine L’Engle in Many Voices by Leonard Marcus for the Wall Street Journal (1/12/2013). “Adventures in Invention.” I review Frank Reade: Adventures in the Age of Invention by Paul Guinan and Anina Bennett for the Wall Street Journal (2/18/2012). “Instinct With Hellish Life.” I review Zone One by Colson Whitehead and Zombies! Zombies! Zombies!, edited by Otto Penzler, for the Wall Street Journal (10/15/2011). “Mario’s Many Fathers.” I review Super Mario: How Nintendo Conquered America by Jeff Ryan for the Wall Street Journal (8/20/2011). “A Far-Seeing Family.” I review Discoverers of the Universe: William and Caroline Herschel by Michael Hoskin for the Wall Street Journal (3/26/2011). “The Man Who Made a Planet Vanish.” I review How I Killed Pluto and Why it Had it Coming by Mike Brown for the Wall Street Journal (11/26/2010).